The word of broccoli alone probably doesn’t attract much of your attention. Ginkgo nuts + broccoli might though! You probably heard about Ginkgo Biloba on and off somewhere. To be using Ginkgo nuts in cooking might be new to you especially if you are not familiar with authentic Asian cooking. My mom used quite a fair bit of ginkgo nuts in her cooking, especially when she fixed us herbal soup. However, the usage of ginkgo nuts is not limited to just that. 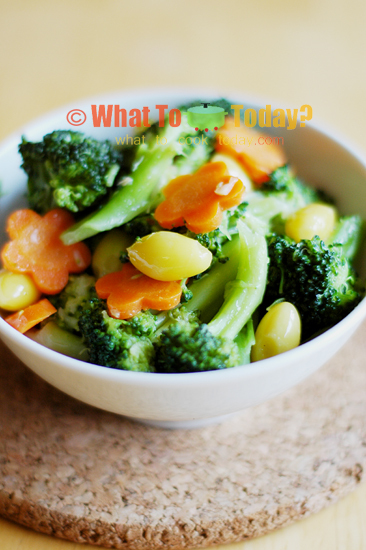 They have been used in dessert and other dishes, such as this stir-fried broccoli with ginkgo nuts, porridge/congee, etc. So what is ginkgo biloba ? The tree of ginkgo biloba is huge (yes, it’s a tree) and they are also wide-spread throughout the world. Inside the seeds of ginkgo are what being used in cooking, the ginkgo nuts. You crack the shell of the seed opened and you’ll find the yellowish nut in there. Once you boil it, it will soften. My mom often bought the seeds in bulk, boil them and crack them up to get the nuts out and then freeze them for longer shelf-life. Of course you probably also heard about the use of ginkgo in treating Alzheimer disease and to enhance memory. Well, it’s still controversial up to this point I believe. I just happened to like ginkgo nuts. They are slightly bitter in taste, but I find it quite addicting. I think it’s either you like it or you don’t kind of thing. Stir-frying the broccoli with ginkgo nuts is just bringing the dish up to another level. This also is an eye-opener to me as we are really limited by our own mind as what we can really whip up with plethora of ingredients out there.